Inspiration for your vow to me? 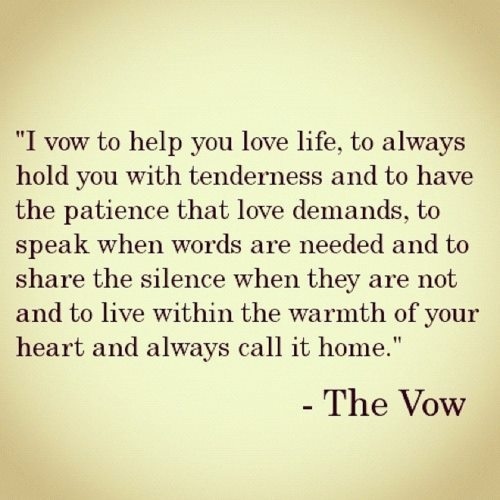 So I watched the trailer for this movie The Vow today and it looked like the type where I’d cry at. Which I nearly did when certain scenes were played. The short clip was beautifully edited with enough pangs of sorrow accompanied by a melancholic soundtrack to tug at my heart strings. I have no idea why the older I get, the more emotional I become at sad movies. This does not make any sense. Anyway, from those brief minutes onscreen, I have more or less figured out the storyline. Couple gets into accident, girl loses her memory, guy tries very hard to woo her back, girl becomes confused and rejects him, guy tries harder and nearly gives up, girl finally feels the love, they become a couple again. Right? Right. Well, in movies true love means two people who are meant for each other will always come together again. The girl will always figure it out. Without fail. Obviously. I vow to love you, and no matter what challenges might carry us apart, we will always find a way back to each other. Bet you are falling in love with me all over again. So am I. HA!